One of its key objectives of ICPE is to work together with civic authorities and other Govt. Departments in facilitating collection and recycling of plastic waste through technological inputs. Indian Railways are a large source of plastic waste in the form of PET bottles (drinking water), food packaging, tumblers and cups etc. Part of the waste is collected and sold to recyclers; large amount of waste gets strewn on the rails or littered inside and outside the coaches. Plastics are light in weight but rather voluminous and any attempts of collection of the waste get hampered because of difficulty in transporting the voluminous waste. ICPE have devised a compactor that can be used to reduce this volume by compacting so that transportation becomes relatively easier. 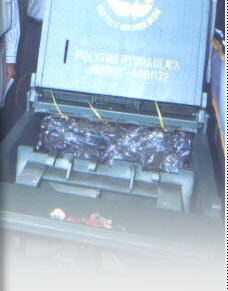 In October 2001, ICPE set up a compactor machine made at a cost of about Rs 1.75 lakhs with a capacity of 6  8 bales of PET bottles per hour at the Mumbai Central station. Western Railway has provided space and power for keeping and running of the compactor at Mumbai Central. The compactor has been operating at the Mumbai Central since October with good success. The two contract workers on the job collect bottles from various parts of the station; bring the bottles to the storage bins at the compaction site. The caps, labels are then removed manually from each bottle since these are made from other type of plastic material and can interfere in the PET plastic recycling process. With this, the bottles are ready for compaction. At the moment the collection rate is around 1000  1500 bottles a day. The compacted bales are taken away by the recycler appointed by ICPE and transported to the recycling units. One tempo load roughly equals 250 kgs. of baled bottles. (About 10,000 bottles). As in any other pilot projects, there are problems to be sorted out such as raising public awareness, coordination with a number of agencies but the central idea that there is a solution to used PET bottles seems to be catching on. According to Western Railway authorities, 2000 PET bottles are collected or found littered daily on the station. Based on the success of this project, the Railway authorities are considering to install such compactors at other railway stations too, as it solves the problem of disposing voluminous waste. ICPE will be coordinating in such future projects. Presently discussions are in progress with railway officials and other PET bottle end-users such as Mineral water bottling companies to upgrade the technology and examine the replication of the project at other stations.